Harvoin saatavilla. Suosituin ominaisuus. Paras sijainti, allas / pyörät ja paljon muuta ..
Tämä talo sijaitsee yksityisellä rantakaistalla, yksityisellä tilalla nimeltä Kailua Gardens. Tulisit taloon portaiden yläpuolella altaan vieressä. Huomaa toinen kylpyhuone sijaitsee alakerrassa vieressä pesula / allasalue. Kiinteistössä on kaksi muuta vuokrausta, Sunshine Suite ja Palm Villa, joka jakaa altaan. Parasta on vain kävellä yksityisellä rantakaistalla ja alle 2 minuutissa olet Kailuan rannalla, joka on maan kaunein ranta! Se sopii hyvin lapsille. Vesi on rauhallinen, koska on koralliriutta 1/2 mailin päässä rannasta, jossa aallot rikkoutuvat. Voit snorklata, uida, kajakkia tai vain kävellä rannalla tuntikausia. Voit myös katsella auringon nousua aamulla valtameren yli ja kuun nousta illalla. Se on todella henkeäsalpaava! Tutustu alla oleviin kuviin ja kerro meille, haluatko viettää lomasi kanssamme. Olisimme halunneet sinut jäädäkseen. Aloha! Yksityinen aidattu omaisuus, kävelymatkan päässä rannalta, ilmainen langaton internetyhteys, ilmainen pysäköinti, AC kaikissa huoneissa, digitaalinen kaapelitelevisio HBO, upea uima-allas, poreallas, täydellinen keittiö, kaasu BBQ, pyörät, ranta tuolit / matot / lelut / pyyhkeet, Lush Tropical Puutarhat, alennukset pidempään oleskeluun. Awesome. Place was awesome and hosts were awesome. The place itself had everything we needed: beach towels, chairs, boogie boards, sand toys, bikes, kitchen stuff to cook meals, etc. The ice maker was incredible. We could load up our cooler everyday without having to buy the ice! If anything wasn't completely perfect, I would say the swimming pool was a bit too cold for my skin. However, it didn't matter with the ocean a skip away and spending time there everyday. We also went to the YMCA a few times to lift weights and swim in their salt water pool. (We have a nationwide membership.) And we also walked and swam in the nearby 50 meter community pool. Walking to downtown was easy (didn't need a car) as well. We had a great stay in the Kukui house. Very comfortable rooms and relaxing setting. Very quiet yet right across the street from an amazing beach/park and easy walking distance to restaurants and some shopping. Windward Oahu has some of the best beaches anywhere, lots of the others within easy driving distance. Place has excellent stuff included- beach chairs, coolers, toys, bikes, etc. Many thanks to Zak and Steve and Susie- they are all super friendly and great help with local advice. Great spot. 5 minutes to Beach. We loved Kailua and this little apartment was the perfect jumping off place to enjoy the beach and everything else the town had to offer. The hosts live on site nearby and were very friendly and welcoming. Planning another stay here next year! We had a fun stay in the Kukui house over Thanksgiving. The house has great amenities- ac in every room, the pool, plenty of dishes, towels, beach toys, etc. A couple of things could be improved, though- there were a lot of bugs, especially ants. I think that probably had to do with all of the vegetation around (which was so beautiful), but even after I let the owners know about it, it didn't get better. It would also be great if they could add some towel hooks or hanging rods, because there isn't really any place to hang wet towels, swimsuits, etc. 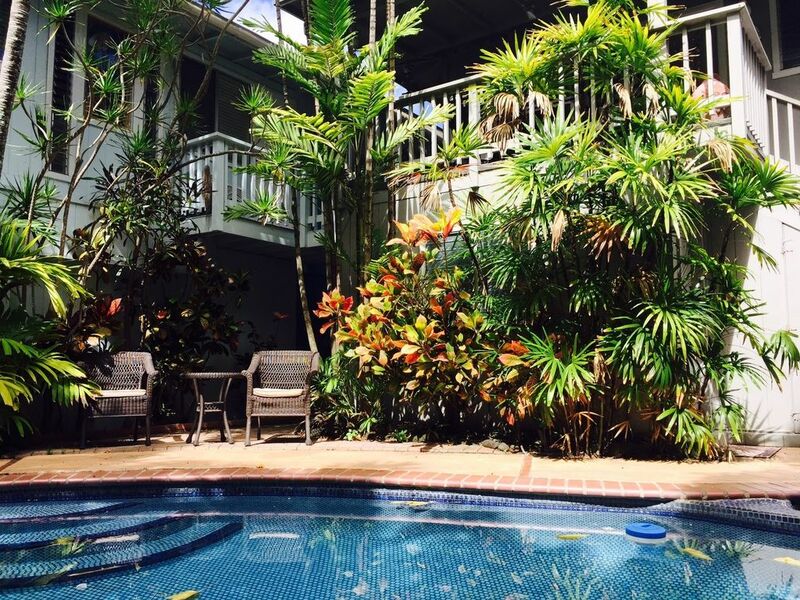 Those were pretty minor inconveniences, though, and overall we had a really great time with the pool, the close proximity to the beach and staying in Kailua. Pro's: EXCELLENT location, clean, pretty well stocked including beach gear, air conditioning, and beautiful, private pool area. Con's: upstairs apt. was advertised as having two bathrooms, but one is downstairs (not convenient for 4 senior ladies). Pool not heated, so used very little. Air conditioners in bedrooms are noisy, so we used them to cool off the bedrooms (after being gone all day) and then turned them off and opened windows. That worked most of the time. Zak was very pleasant to work with and accommodate our reasonable requests! He also returned our damage deposit the day after we arrived home!